Maria is a freshman from Oak Brook, IL. Maria plans to major in Cognitive Science and minor in Computer Science, and she joined The D because she wants to bring attention to current events on campus. In her free time, she enjoys golfing, learning about new cultures, and playing with her two puppies. 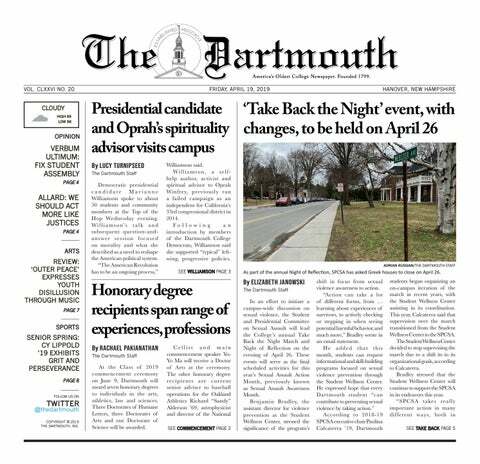 Chabad at Dartmouth now has a new place in Hanover to call home. On Oct. 14, the Hilary Chana Chabad House — located two blocks from the Green at 19 Allen Street — opened the doors of its new 9,000-square-foot building with a weekend of festivities that culminated in a dedication ceremony on Sunday. The grand opening included remarks by Chabad Rabbi Moshe Gray and other prominent figures in the College’s Jewish community, student speeches, and a ribbon-cutting ceremony, as well as presentations to George and Pamela Rohr, Sue Ann Arnall and Robert and Debbie Ezrapour, who helped fund the $3.2 million purchase and renovation of the new house. Women’s suffrage accomplished far more than simply giving women the right to vote, according to a new working paper. In “Who Benefitted From Women’s Suffrage?” published in August, three economists — the College’s Na’ama Shenhav, Bucknell University’s Esra Kose and Southern Methodist University’s Elira Kuka — found that economically disadvantaged children benefited significantly after women gained the right to vote. The researchers found that women’s suffrage increased children’s “educational attainment,” which includes how long they stayed in school and their literacy levels, as well as their future incomes. Shakily gripping his iPhone, a father zooms in on his daughter’s tense expression, as she stares at her glowing laptop. In late April, the made-to-order Roslin’s Sushi service located in Collis Café announced its temporary unavailability because it had been operating without a permit to make sushi on College premises. Free shipping does not come cheap — at least not for online retailers. In a working research paper for the Tuck School of Business, updated in Jan. Rabbi Edward Boraz has served as the rabbi for both the Dartmouth and the Upper Valley Jewish Community congregations for the past 20 years. Best friends often share similar tastes in everything from music to clothes, but what if they also have similar brain activity? Over winter interim, 12 Dartmouth students traveled to Monrovia, Liberia, where they witnessed a historic Supreme Court ruling that preceded a runoff presidential election, marking Liberia’s first democratic, peaceful handover of power since 1944. “The election was actually supposed to be finished by the time we got to Liberia, but it was contested, so it ended up going through the Supreme Court. On Oct. 24, the Student and Presidential Committee on Sexual Assault released its 2017 recommendations for increasing sexual assault prevention and response in the Dartmouth community.